After Nokia 7 Plus and Nokia 6.1/Plus, Nokia finally rolling out the Android 9 Pie Stable Update for Nokia 8 Sirocco. The Stable Pie update for Nokia 8 Sirocco comes with build number v4.120 and bring the December 2018 security patch. Follow below guide to Download and Install Nokia 8 Sirocco Android Pie Update. The Nokia 8 Sirocco Android 9 Pie features a new Digital Wellbeing dashboard, gesture-based navigation system, AI-enhanced improvements to the UI, Recent App Switcher, new Adaptive features (adaptive battery and brightness), along with December 2018 security patch. Download Nokia 8 Sirocco Android 9 Pie OTA Update from below. There is two method to get Android Pie on your device either install Android Pie OTA Updates or Download the Android Pie OTA and flash it manually. If you’re already using the Android P build on your Nokia 8 Sirocco, you can grab the OTA file and sideload it without deleting your data. 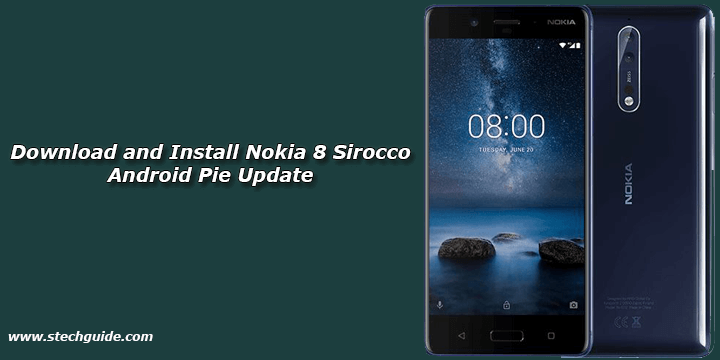 Follow below guide to Download and Install Nokia 8 Sirocco Android Pie Update. This method will work only on Nokia 8 Sirocco variants. Below method is not tested so do it at your own risk. We are not responsible for any damage to your phone. Download the OTA zip file from above and save it on your device. Place it to the root directory of internal storage. Download the Nokia 8 Sirocco Android Pie OTA zip from above Copy ROM to a folder where adb installed. So this the complete guide to Download and Install Nokia 8 Sirocco Android Pie Update. If you have any doubts comments below. Stay connected with us via Facebook, Twitter, and Google Plus to read more such helpful posts.